Dear Ida, Robert and Mary’s was a God send in our time of need. The care there was exceptional and I appreciated everything you did there. Ray enjoyed his days with everyone even thou we had a hard time getting him to stay. I thank you all for the kindness and support you gave to us. I am more than pleased to write a testimonial about the service that Robert and Mary’s place offers. My mother was a friend who attended your day care program a few year’s ago. First of all, your service consisted of door to door transportation! Secondly, my mother was always met with positive greetings and smiles every time. 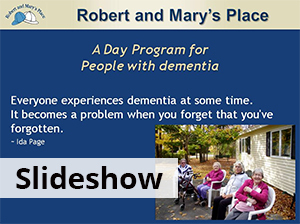 while at Robert and Mary’s Place, she enjoyed the many activities, games, birthday parties, holiday parties and other social interaction that was offered there. It kept her alive and happy. A very nutritious lunch was always served, as well as mid-morning and afternoon snacks. There was no pressure for any of the friends who attended the program to participate in any of the activities; they could do whatever they felt comfortable doing. 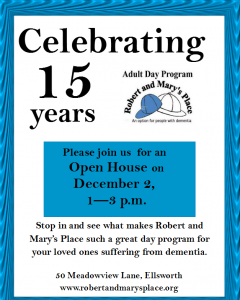 I think that attending Robert and Mary’s Place was the highlight of the day for my mother and I am so glad that a program like this was available to her. I am very grateful to Ida Page who had the vision and foresight and determination to make it a reality. The grace and comfort of a respite daycare such as Robert and Mary’s Place comes from a staff who has a clear and compassionate understanding of Alzheimers Disease and other forms of memory loss. They “get it”… They understand that a person whose mind is disappearing in the fog of Alzheimers has no options. With my husband, whatever the disease led him to say or do… that was it for the moment. At Robert and Mary’s Place he was never made to feel he was wrong, inappropriate or difficult. The caregivers understood that an Alzheimers victim cannot problem solve or change course, so they accepted him “where he was” at the time, then worked to prevent or ameliorate upsets. I called one morning when everything in his world was going awry. I felt I should tell them that it looked like a really bad day for him and suggested maybe he should stay at home. “Nonsense.” was the reply. “That is what we are here for and he needs to be here with us. Bring him along and maybe we can make his day a little more comfortable for him”. They did. Respite help from Robert and Mary’s Place, especially during the final six months when I was often wondering if I could manage another day, made it possible for us to care for him at home until the end of his life. It was a blessing for Charlie, and to the family who loved him, to have those extra months. We will always be grateful. I have nothing but praise for the Director and staff of Robert and Mary’s Place. When I leave my sister there in the morning, I have peace of mind that she will be well cared for, and I can concentrate on my daily activities without worry about her well-being. Everyone there is capable, caring, and pleasant. Although she presents a challenge because she no longer speaks, has swallowing difficulties, and is no longer steady on her feet, they have found ways to communicate with her and meet all her needs, while maintaining a cheerful attitude. She is treated with respect and love. The director and her staff emanate a cheerful and caring attitude which is contagious, and I sense that the visiting friends also care about my sister and genuinely like her. I am very grateful that she is welcome there. The deep anger she had when I first began taking care of her about 5 years ago is all gone, and I give a lot of credit for that to the patient and loving care she has received at Robert and Mary’s Place. The Robert and Mary’s program is a vital part of my family’s wellbeing. At Robert and Mary’s Place my loved one finds companionship, laughter, affection, stimulation, activities both physical and cognitive, and connection with life. Without this program she would be spending solitary days sitting in a chair. As her sole family caregivers, my husband and I are inexpressibly grateful for the respite and peace of mind Robert and Mary’s gives us. I truly believe that without this program my family’s mental and physical health would rapidly deteriorate. During the two and a half years my loved one has been attending, the program has been consistently excellent. The staff is superior. Their expertise in memory loss elder care is matched by their vibrant personalities, creativity, sense of humor, compassion, respectful attitude, and upbeat manner. When I drop my loved one off in the morning, I feel as if I am putting her in the hands of the extended family I wish I had. Words can not express how grateful I am for this program. Thank you.